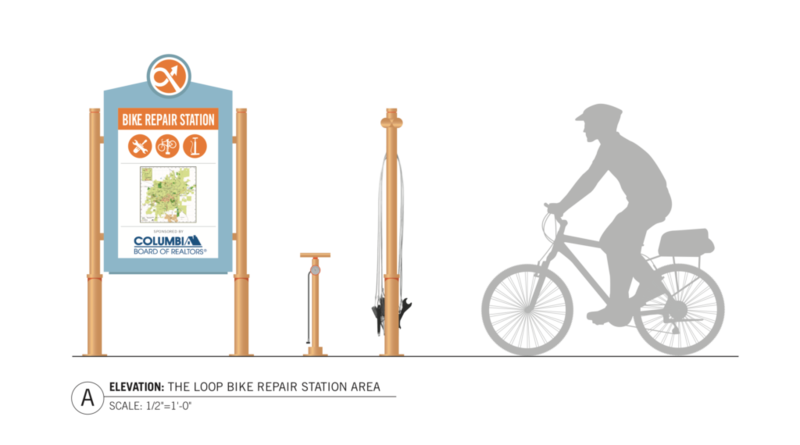 We’re building a bike station on the west side of the Business Loop! Thanks to grant funding from the Columbia Board of Realtors, volunteer help from ForColumbia, and support from the folks at Parkade Plaza, we’re building a second public space at Parkade Plaza near the MKT-Parkade Bike Boulevard. This space will have a bike repair station, an air pump, a bike rack, and a bench all surrounded by potted plants so you can stop for a moment and fill up your tires at a pleasant spot. https://www.forcolumbia.com/serving_site/the-loop-bike-repair-station/. You’ll also receive lunch and a t-shirt, and we’ll be sending everyone down to the pop-up park to have lunch with the entire Loop Beautification crew.